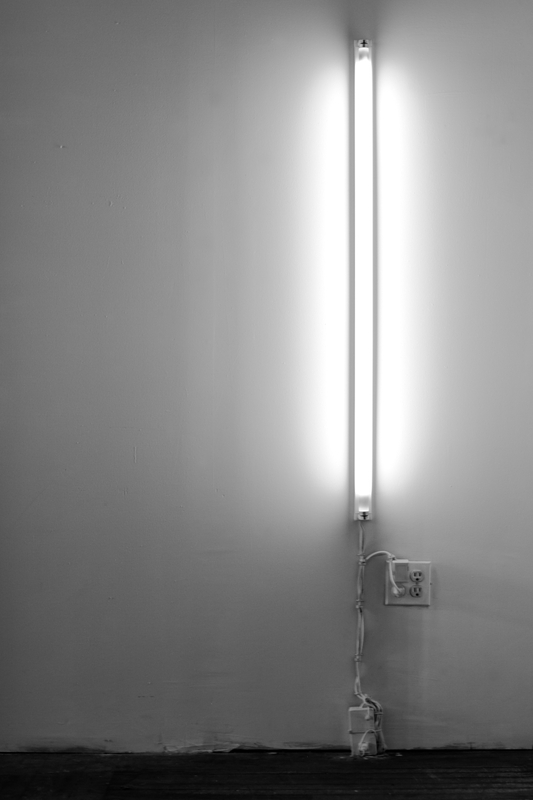 A fluorescent tube has been modified to visualize the presence of radiation. As highly energetic particles collide with the Geiger counter installed within the lighting fixture, they create electron cascades, small showers of elementary particles that are then amplified and made visible by custom electronics. Each flash of light indicates the presence of a single radioactive particle ending its journey as it is absorbed by the materials of the piece. Ionizing radiation has the energy to strip electrons from atoms, leaving positively charged free radicals to damage biological tissue. Sources of ionizing radiation include nuclear fission, nuclear fusion, radioactive decay and cosmic rays, energetic photons produced during the big bang and other major cosmological events. Cosmic rays likely plays a key role in genetic mutations through the destruction of DNA, the initiation of lightning strikes, and is a source of random glitches in computer systems. Cosmic rays are also implicated in the observance of light flashes by astronauts outside the Earth’s magnetosphere.